Building the future: Graduates of the new architectural engineering bachelor’s degree program will be prepared for in-demand jobs in the architecture, engineering, and construction sectors. Beginning this fall, UT Arlington will offer the first architectural engineering bachelor’s degree program in North Texas to prepare a new generation of students for careers in design-, construction-, and engineering-related fields. The program will be based on 120 semester credit hours and incorporates courses in civil engineering, architecture, studio design, and engineering design. Graduates will be ideally suited to fill in-demand jobs in the architecture, engineering, and construction sectors. The new degree plan will be offered jointly by the College of Engineering and the proposed College of Architecture, Planning and Public Affairs, an integration of the existing School of Architecture and School of Urban and Public Affairs. 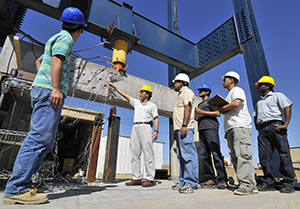 Read more about the architectural engineering degree program. Students should not fall for a phone scam in which the callers identify themselves as members of a governmental agency and demand money. The caller threatens to arrest students on false or fictitious charges if immediate payment is not made to the suspects via a money card. Dozens of additional students have reported similar calls from individuals posing as representatives of local law enforcement agencies, state agencies, the Internal Revenue Service (IRS), and other federal agencies. Some calls have targeted international students. However, offenses are being reported by students of varying backgrounds. Candidates for dean of the College of Liberal Arts will meet with administrators, faculty, staff, and students. A feedback survey for the first candidate—Seth Mallios, professor and chair of the Department of Anthropology at San Diego State University—is available through 5 p.m. today, Tuesday, May 5. His session was Monday. "Fight Back Against Procrastination" offers free tutoring, research, and writing support 7-11 p.m. today, Tuesday, May 5, on the second floor of the Central Library. The University Center is open continuously for finals from 7 a.m. Sunday, May 10, to 11 p.m. Wednesday, May 13. Find unconditional love on the second floor of the Central Library with the Paws for Finals registered therapy dogs Wednesday-Saturday, May 6-9. Studies have shown that petting a friendly dog offers numerous health benefits. 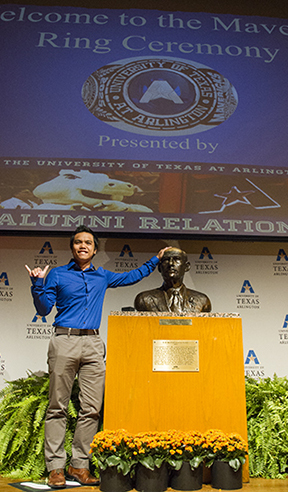 Paws With Partners registered therapy dogs are available noon-2 p.m.
Tung Nguyen, business senior, rubs the bronze head of E.H. Hereford at the Maverick Ring Ceremony on Thursday in the Bluebonnet Ballroom. Rubbing the former University president's head is a longtime campus tradition for good luck and a new part of the ring ceremony. Ernest H. Hereford was dean of North Texas Agricultural College and the first president of Arlington State College, both predecessors of UT Arlington. Nguyen also was crowned Homecoming king last fall. Grab a cup four hours before closing time at the Architecture and Fine Arts Library through Thursday, May 14, and the Science and Engineering Library on Friday-Thursday, May 8-14. Parking spaces in Lot 26 and 27 surrounding Maverick Stadium will be used Friday-Sunday, May 8-10, for the Annual Texas Scottish Festival & Highland Games. Other technology available for checkout includes laptops, calculators, drawing tablets, and telepresence robots. Summit Avenue from Greek Row Drive to Fourth Street will be closed to allow the city of Arlington to upgrade water and sewer lines and resurface the street. Arbor Oaks tenants will need to enter their parking lot from either Kerby Drive or Fourth Street. The Office of Information Technology performs regularly scheduled maintenance on MyMav, OIT servers, and the campus network 2-7 a.m. every Sunday. Occasionally, additional maintenance may occur between 7 a.m.- noon. The system will be unavailable during those times. Automated software updates are the second Tuesday of each month for Microsoft products and the fourth Tuesday of each month for supported software. Visit OIT's software update page for more information about upcoming maintenance. 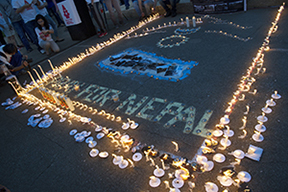 A candlelight vigil last Wednesday night showed UT Arlington's support for those affected by the earthquake in Nepal. The Nepalese Student Association organized the vigil on the library mall. The group is collecting donations for disaster relief. The UTA Bookstore remains open during its renovations, which include adding a new Starbucks Café. The bookstore will be open regular hours with east and west entrances open. Park at the College Park District garages or retail lots. Final exams are scheduled for Saturday-Friday, May 9-15. See the full final exam schedule online. Baseball Mavericks vs. Appalachian State. Tickets $5-7; $3 students. 6:30 p.m. Also, 2 p.m. Saturday, May 9; 1 p.m. Sunday, May 10. All at Clay Gould Ballpark. Athletics. UTA Dance Ensemble Recital $5 with student ID, $7 general admission. 8 p.m., Mainstage Theatre. Also, Saturday-Sunday, May 9-10. Theatre Arts Department. Arlington Technology Association George Siemens, right, executive director of the Learning Innovation and Networked Knowledge (LINK) Research Lab, explores how education is changing due to massive open online courses (MOOCs), big data, digital networks, and the Internet. Light breakfast provided. RSVP. Free. 7-8 a.m., Room 100, Nedderman Hall. Arlington Technology Association. Social Work Colloquium Jeffrey Jenson is guest speaker at the Colloquium on Agency Collaboration and Community-Based Human Service Innovation. He will discuss the public health approach for preventing child and adolescent health and behavior problems and preventive interventions aimed at promoting positive youth development. Dr. Jenson is the Philip D. and Eleanor G. Winn Professor for Children and Youth at Risk at the University of Denver. Register online. 1-4 p.m., Room 107, Social Work Complex General Academic Building. Social Work. U.S. Manufacturing Symposium The symposium is a Walmart initiative to create affordable, flexible, automated solutions to bring manufacturing back to the United States. See the schedule. Admission $35, $120 for exhibitors; 25 free passes for students. Wednesday, June 3, UTARI, 7300 Jack Newell Blvd. S., Fort Worth. UT Arlington Research Institute. Double up: Top, cross country's Hannah Nilsson, left, and baseball's Travis Sibley were honored as the Athletics Alumni Student-Athletes of the Year at the All-Sports Banquet last Monday. Bottom, the Maverick tennis doubles team of Elizabeth Thoms, left, and Angeles de los Rios will represent UTA in the 2015 NCAA Division I Women's Tennis Championships. The doubles competition is May 20-25 at the Hurd Tennis Center in Waco. Sophomore right-hander Joel Kuhnel pitched eight scoreless innings as UTA defeated Arkansas-Little Rock 7-2 on Sunday to complete a three-game sweep at Clay Gould Ballpark. The Mavericks won the first game 12-0 on Friday and the second game 7-3 on Saturday. The sweep moves them into seventh place in the Sun Belt Conference. The top eight teams qualify for the conference championship May 20-24 in Troy, Ala.
UTA plays at No. 14 Dallas Baptist today, Tuesday, May 5, before hosting Appalachian State for three games Friday-Sunday, May 8-10, at Clay Gould Ballpark. The softball team earned the No. 7 seed and will face sixth-seeded Louisiana-Monroe at 10 a.m. Wednesday, May 6, in the first round of the Sun Belt Conference Championship in San Marcos. The Mavericks dropped all three games of a weekend series against Texas State at Allan Saxe Field to end the regular season at 27-27 overall and 8-15 in conference play. On Sunday, UTA celebrated the careers of Nina Villanueva and Meagan Michele for Senior Day. Villanueva is the current single-season leader for batting average, while Michele is third in single-season home runs. UTA Athletics celebrated the accomplishments of Maverick student-athletes last Monday at the annual All Sports Banquet at College Park Center. The evening featured remarks by Athletic Director Jim Baker, President Vistasp Karbhari, and alumnus George Riba, who recently retired after 37 years as a sports reporter at WFAA/Channel 8 in Dallas. Among the many awards presented were the Athletics Alumni Student-Athletes of the Year, which went to cross country's Hannah Nilsson and baseball's Travis Sibley. Read more about the All Sports Banquet and see a list of winners. • The doubles team of Elizabeth Thoms and Angeles de los Rios will represent the Mavericks as automatic qualifiers in the 2015 NCAA Division I Women's Tennis Championships on May 20-25 in Waco. • Freshman golfer Aaron Guanlao was named to the All-Sun Belt Conference second team, and fellow freshman Jake Greenspoon was named honorable mention. 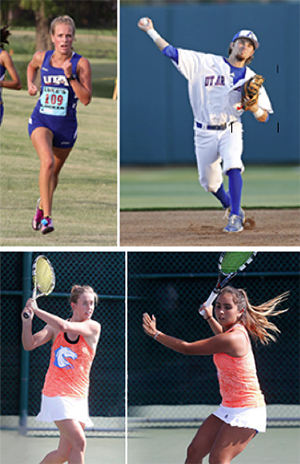 • The men’s and women’s track teams compete Friday-Sunday, May 8-10, at the Sun Belt Conference Outdoor Championships in Gulf Shores, Ala.
Upcoming entry deadlines for intramural sports include FIFA video game, Wednesday, May 6, and poker tournament, Thursday, May 7.